Cross Data Center Replication (CDCR) allows you to create multiple SolrCloud data centers and keep them in sync in case they are needed at a future time. The SolrCloud architecture is not particularly well suited for situations where a single SolrCloud cluster consists of nodes in separated data clusters connected by an expensive pipe. The root problem is that SolrCloud is designed to support Near Real Time Searching by immediately forwarding updates between nodes in the cluster on a per-shard basis. "CDCR" features exist to help mitigate the risk of an entire data center outage. CDCR supports replicating data from one data center to multiple data centers. The initial version of the solution supports an active-passive scenario where data updates are replicated from a Source data center to one or more target data centers. Source and target data centers can serve search queries when CDCR is operating. The target data centers will have slightly stale views of the corpus due to propagation delays, but this is minimal (perhaps a few seconds). Data changes on the source data center are replicated to the target data center only after they are persisted to disk. The data changes can be replicated in near real-time (with a small delay) or could be scheduled to be sent in intervals to the target data center. This solution pre-supposes that the source and target data centers begin with the same documents indexed. Of course the indexes may be empty to start. 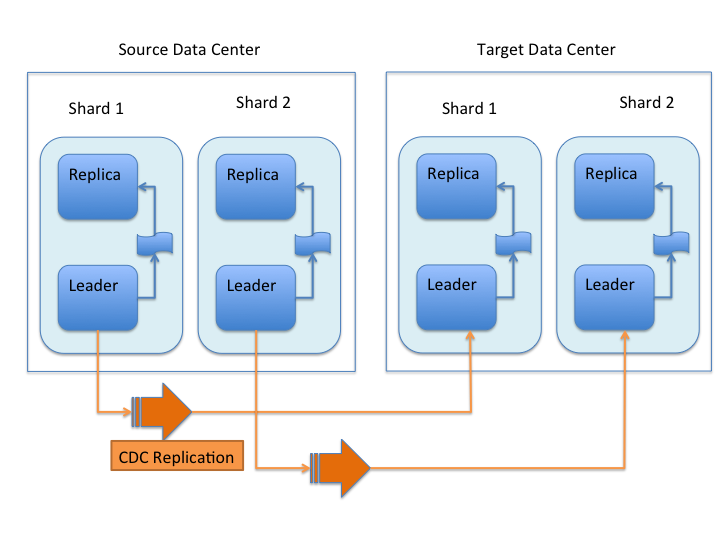 Each shard leader in the source data center will be responsible for replicating its updates to the corresponding leader in the target data center. When receiving updates from the source data center, shard leaders in the target data center will replicate the changes to their own replicas. Replication supports both a new empty index and pre-built indexes. In the scenario where the replication is set up on a pre-built index, CDCR will ensure consistency of the replication of the updates, but cannot ensure consistency on the full index. Therefore any index created before CDCR was set up will have to be replicated by other means (described in the section Initial Startup) so source and target indexes are fully consistent. The active-passive nature of the initial implementation implies a "push" model from the source collection to the target collection. Therefore, the source configuration must be able to "see" the ZooKeeper ensemble in the target cluster. The ZooKeeper ensemble is provided configured in the Source’s solrconfig.xml file. A set of Solr nodes managed as a single unit by a ZooKeeper ensemble, hosting one or more Collections. A sub-index of a single logical collection. This may be spread across multiple nodes of the cluster. Each shard can have as many replicas as needed. Each shard has one node identified as its leader. All the writes for documents belonging to a shard are routed through the leader. Multiple documents that make up one logical index. A cluster can have multiple collections. A shard leader receives a new data update that is processed by its update processor chain. Upon successful application of the data update on the local index, the data update is added to the Updates Log queue. After Step 4 is successful, CDCR reads the data update from the Updates Log and pushes it to the corresponding collection in the target data center. This is necessary in order to ensure consistency between the Source and target data centers. One implication of the architecture is that the leaders in the source cluster must be able to "see" the leaders in the target cluster. Since leaders may change, this effectively means that all nodes in the source cluster must be able to "see" all Solr nodes in the target cluster so firewalls, ACL rules, etc. must be configured with care. Having different numbers of shards on the Source and target cluster is possible, but is also an "expert" configuration as that option imposes certain constraints and is not recommended. Most of the scenarios where having differing numbers of shards are contemplated are better accomplished by hosting multiple shards on each target Solr instance. In order to configure CDCR, the Source data center requires the host address of the ZooKeeper cluster associated with the target data center. The ZooKeeper host address is the only information needed by CDCR to instantiate the communication with the target Solr cluster. The CDCR configuration file on the source cluster will therefore contain a list of ZooKeeper hosts. The CDCR configuration file might also contain secondary/optional configuration, such as the number of CDC Replicator threads, batch updates related settings, etc. Communication between data centers will be achieved through HTTP and the Solr REST API using the SolrJ client. The SolrJ client will be instantiated with the ZooKeeper host of the target data center. SolrJ will manage the shard leader discovery process. CDCR replicates data updates from the source to the target data center by leveraging the Updates Log. A background thread regularly checks the Updates Log for new entries, and then forwards them to the target data center. The thread therefore needs to keep a checkpoint in the form of a pointer to the last update successfully processed in the Updates Log. Upon acknowledgement from the target data center that updates have been successfully processed, the Updates Log pointer is updated to reflect the current checkpoint. If for some reason, the target data center is offline or fails to process the updates, the thread will periodically try to contact the target data center and push the updates. The shard leader in the source cluster will be in charge of generating a unique identifier for each update operation, and will keep a copy of the identifier of the last processed updates in memory. The identifier will be sent to the target cluster as part of the update request. On the target data center side, the shard leader will receive the update request, store it along with the unique identifier in the Updates Log, and replicate it to the other shards. SolrCloud already provides a unique identifier for each update operation, i.e., a “version” number. This version number is generated using a time-based lmport clock which is incremented for each update operation sent. This provides an “happened-before” ordering of the update operations that will be leveraged in (1) the initialization of the update checkpoint on the source cluster, and in (2) the maintenance strategy of the Updates Log. The CDCR replication logic requires modification to the maintenance logic of the Updates Log on the source data center. Initially, the Updates Log acts as a fixed size queue, limited to 100 update entries. In the CDCR scenario, the Update Logs must act as a queue of variable size as they need to keep track of all the updates up through the last processed update by the target data center. Entries in the Update Logs are removed only when all pointers (one pointer per target data center) are after them. If the communication with one of the target data center is slow, the Updates Log on the source data center can grow to a substantial size. In such a scenario, it is necessary for the Updates Log to be able to efficiently find a given update operation given its identifier. Given that its identifier is an incremental number, it is possible to implement an efficient search strategy. Each transaction log file contains as part of its filename the version number of the first element. This is used to quickly traverse all the transaction log files and find the transaction log file containing one specific version number. CDCR is currently only active-passive; data is pushed from the Source cluster to the target cluster. There is active work being done in this area in the 6x code line to remove this limitation. The host address for ZooKeeper of the target SolrCloud. Usually this is a comma-separated list of addresses to each node in the target ZooKeeper ensemble. The name of the collection on the Source SolrCloud to be replicated. The name of the collection on the target SolrCloud to which updates will be forwarded. The number of threads to use for forwarding updates. One thread per replica is recommended. The delay in milliseconds for the monitoring the update log(s). The number of updates to send in one batch. The optimal size depends on the size of the documents. Large batches of large documents can increase your memory usage significantly. The delay in milliseconds for synchronizing the updates log. The state of the buffer at startup. The CDCR API is used to control and monitor the replication process. Control actions are performed at a collection level, i.e., by using the following base URL for API calls: http://localhost:8983/solr/<collection>. Monitor actions are performed at a core level, i.e., by using the following base URL for API calls: http://localhost:8983/solr/<collection>. Query Parameters: There are no parameters to this command. The current state of the CDCR, which includes the state of the replication process and the state of the buffer. Output Content: The status of CDCR and an indication that the buffer is disabled. Query Parameters: There are no parameters for this command. The “queues” object also contains information about the updates log, such as the size (in bytes) of the updates log on disk (“tlogTotalSize”), the number of transaction log files (“tlogTotalCount”) and the status of the updates log synchronizer (“updateLogSynchronizer”). Output Content: The output is composed of a list “operationsPerSecond” which contains a list of (ZooKeeper) target hosts, themselves containing a list of target collections. For each collection, the average number of processed operations per second since the start of the replication process is provided. The operations are further broken down into two groups: add and delete operations. Output Content: The output is composed of a list “errors” which contains a list of (ZooKeeper) target hosts, themselves containing a list of target collections. For each collection, information about errors encountered during the replication is provided, such as the number of consecutive errors encountered by the replicator thread, the number of bad requests or internal errors since the start of the replication process, and a list of the last errors encountered ordered by timestamp. Customer uses the CDCR approach to keep a remote disaster-recovery instance available for production backup. This is an active-passive solution. Running CDCR with the indexes on HDFS is not currently supported, see: Solr CDCR over HDFS.